Being a Major League Baseball player is an amazing life filled with top of line equipment, chartered flights, and big paychecks. Being a minor league ball player seems slightly less enthralling. Being a Major League Baseball player is an amazing life filled with top-of-the-line equipment, chartered flights, and big paychecks. Being a minor league ball player seems slightly less enthralling. 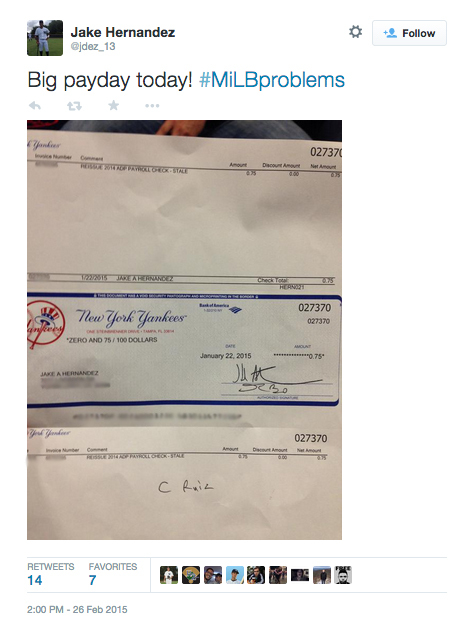 Yankees minor leaguer Jake Hernandez gave a glimpse into the life of a minor leaguer on Thursday when he tweeted out a check he received from the New York Yankees for 75¢. Hernandez later deleted the tweet, because it is never wise to give your home address or any banking information to the internet, even if you are showing everyone how you don't have much to steal. Being a minor leaguer does have its perks though, as Hernandez got to meet beloved Yankees third baseman Alex Rodriguez, which has got to be worth something.